Royal Institution electric battery. 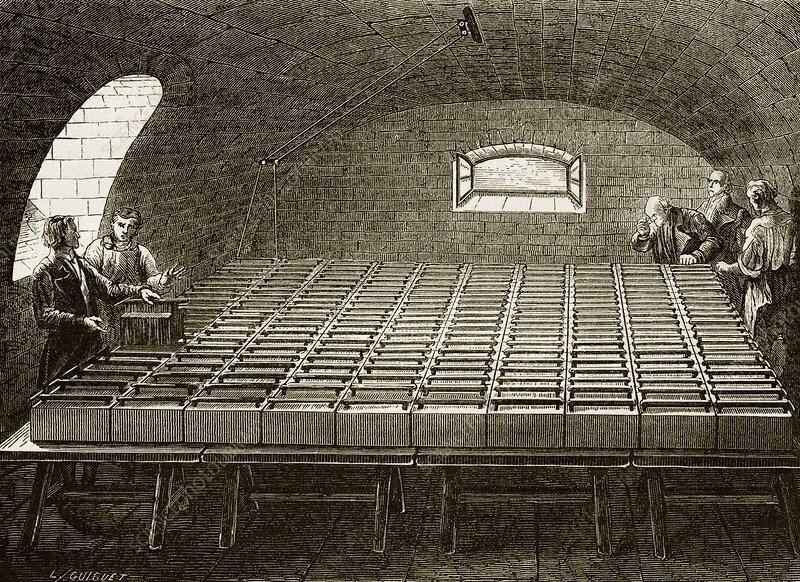 Constructed in 1813, this series of copper and zinc plates was the most powerful battery of the time. It consisted of 200 units of 10 plates each, for a total of 2000 double plates. It was built by British chemist William Wollaston (1766-1828) for Humphry Davy (1778-1829), professor at the Royal Institution, London, UK. It was powerful enough to fuse quartz and sapphire and evaporate diamond, charcoal and lead. Davy also used such batteries for electrolysis to isolate various metals. This room is an imagined setting for the battery.